Pilsner is a proud European beer style that has struggled to find a foothold amongst the American beer snob community, mostly because it was the style of choice for behemoths like Bud, Miller and Coors. For many years smaller American brewers left the pilsner style to the macros while they focused on developing bold IPAs and stouts. As a result most of the pilsners available in the US were mass produced domestically, or imported from Europe and past their peak freshness. Recently pilsner has made a comeback in the beer community. Inspired by the flavorful and refreshing beers in central Europe many American brewers have developed their own take on the style. The original pilsner was developed in Pilsen, in what is now the Czech Republic. The style was immediately popular and pilsner-style beers began to pop up around Europe, but purists insist that true pilsner must be Czech. Czech pilsners use 100% local pilsner malt and the floral and aromatic native Saaz hops. 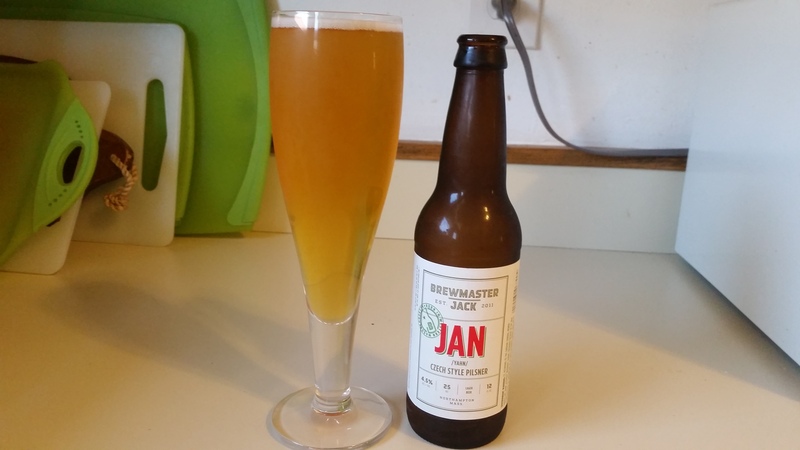 While many American brewers have added extra hops to their pilsners in response to American palates, Brewmaster Jack set out to make a more traditional Czech pilsner with their recent release of Jan (pronounced Yahn). Brewmaster Jack Jan is currently available on draft and in 12 oz. bottles. Brewmaster Jack Jan pours a clear golden yellow with a mild white head. The scent is a mixture of noble hops and bready grains. The flavor is classic pilsner, and by that I mean the flavorful pilsners of Europe not the mass produced adjunct lagers. There is defined malt flavor, touches of crackers and white bread. This is balanced by a solid hit of classic Czech hops (I assume Saaz hops were used but I can’t find confirmation online), notes of cut grass pine and earth. Jan is light bodied, effervescent, and goes down easy at 4.5% ABV. The finish is crisp and clean with minimal aftertaste. Brewmaster Jack Jan is a stellar version of a classic Czech pilsner, plenty of flavor and very easy to drink. If you are a fan of pilsner you need to check this out, and if your only experience with pilsner type beers was pounding Miller or Bud at a college party this will change your opinion of what the style can be. Hoppy Boston score: 4.5/5.